Welcome to Crowd-fund Kangaroo Court. I was thinking of calling it Kickstarter Kangaroo Kourt, but decided that probably wasn't an amazing idea. Each Friday, we'll be looking at one of the many tech startups wanting your cash-money, like a demanding teenager, and deciding whether or not it deserves your financial assistance. First up: Goblin VR. It's a VR headset, then? You look very dapper in it. Yes, thanks for noticing. Goblin VR, the brainchild of Brit Daniel Dolby, is a Google Cardboard/Zeiss VR One type of affair. Just download VR apps and games to your phone, place the handset in the headset, and away you go: you are The Lawnmower Man. Except you're not a homicidal maniac with learning difficulties. I expect. It is the first bit of tech that I've seen for quite some thing that is largely made of fabric. Neoprene, in fact, as used in wetsuits. And why is that good? Yup. The tactile delight that is neoprene also means that it grips whatever phone you put in it, like an over-affectionate rubber man. 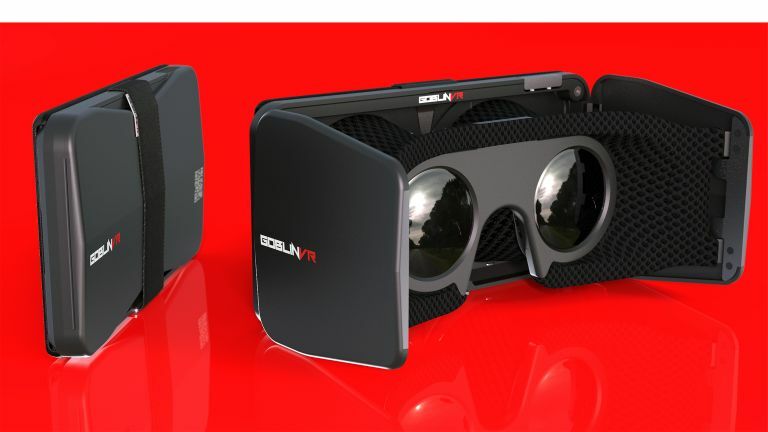 Goblin says, "Goblin VR works with both Android and iOS, Google Cardboard compatible smartphones, with screens between four and six inches." How is it as a VR headset? Thanks to Goblin's allegedly patented, 'Pop-Out Black-Out' system, or 'POBO', the experience is far better than Google Cardboard, which, with the best will in the world, is made of f**kng cardboard. It's also actually not notably worse than the £100+ Zeiss VR, which is made of fancy, new-fangled plastic. POBO is basically a neoprene tunnel with 35mm, Google cardboard-spec lenses at the end, that pulls out and sits on your face. It's a bit like something you might have seen on a camera, or pair of fold-up field glasses, in Edwardian times. Aided by neoprene's close cousin, plastic foam, the POBO blocks out light, feels comfortable against the soft orbits of your eyes, and generally does the business, VR-wise. I viewed a demo in which hige swarms of birds buzzed around me in a field. I think it was meant to be soothing, but the effect was actually rather disturbing; reminiscent of Hitchcock's The Birds. I was impressed. What is the cost of this ground-breaking new approach to VR? Early-bird pricing starts at £30, "including headstrap". Why would you not want a headstrap? I don't know, maybe you've got one already. Goblin sees the device as more of an educational/marketing/quick content sharing 'solution', rather than a full-on, Oculus Rift-style gaming immersion device. With shorter VR applications, it's more convenient to just hold it against your face, rather than using it as a strap-on. "The most compelling, compact, smartphone-driven VR headset to date." A very smart headset with great portability. We'd question whether anyone really needs that, but it's very clever design and reasonably priced at the early bird price. Also by far the best gadget made out of neoprene that we've seen this week.